At first glance, many people would not put the serene and patient art of fly fishing together with the petrol headed jet boat driver. At one end of the scale, there are fly fishermen who enjoy the calm and tranquillity of their chosen hobby with almost the mystic and higher calling of a religion. At the other end of the scale, there are jet boaters who are only happy when sitting on 350cu inches of noisy double barrel V8 horsepower. But somewhere between these two extremes exists a cross-breed who are passionate about their fly fishing and enthusiastic about their method of transport. 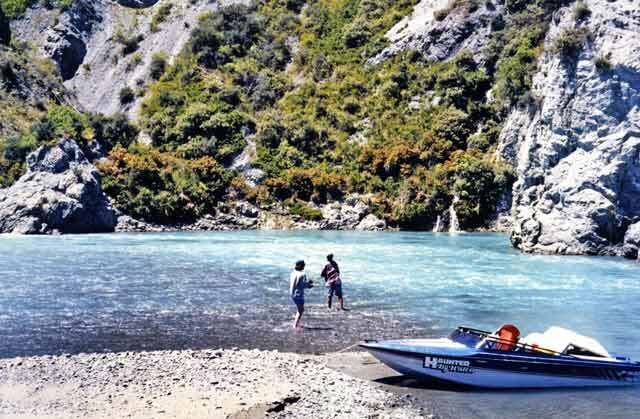 The big advantage of the jet boat is to use the larger rivers in the South Island like a highway to access the smaller tributaries and branches that are difficult to reach over land. 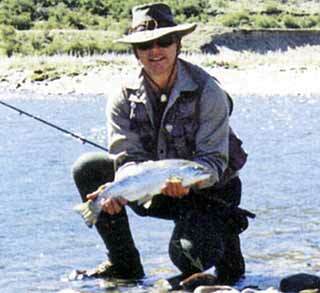 The best fly fishing is in the un-boatable streams and the best boating is in the big braided rivers. Because of this difference, the lead-footed river racer does not usually encounter the purist ﬂy fisher, so all is well. Driving a jet boat up a river fast enough to keep it on the plane and therefore at its shallowest draft is a challenge. Reading the river for the best path to take and having to make those decisions in a split second, when a moment’s hesitation could find you thrown unceremoniously onto a shingle bar or high and dry on the bank, is an exhilarating wind in your face experience that takes practice. These days I feel at one with the river as I navigate my way over shallows, around trees and into whitewater, where pressure waves have a will of their own. I watch the water ahead and anticipate where the river will flow, so my path will be safest. It’s disconcerting to have no idea what lies ahead, but the river has its own pattern, so l try to relax and flow with it. Once l get the feel for the rhythm of the river it’s like gliding, swooping this way and that as the changing colours of the pools and shallows unfurl beneath me. I fly, I swim, I’m a flying fish and the river is my playground. Jet boating is not a solo pursuit, as all the family can enjoy the splendour of the outback even if they do not fish. I regularly take family and friends with me, and they like to walk, paint, explore, or just sit back and soak up the ambience while I fish. It’s an all-embracing outing that covers all ages and stages. Fishing the larger rivers and smaller side streams requires an appreciation of what is happening to the trout who inhabit them. In the same way that a lake provides a resource for restocking the feeder streams, a large river will act as a food and shelter buffer for the smaller tributaries. The volatile nature of small high country streams will vary in conditions markedly, with weather conditions providing high flow one month and warm water low flow conditions the next. Consequently, the trout will move about more in these systems. When the main river is in ﬂood, the trout often take refuge in the smaller streams, then drop back into the main flow when the river subsides. Trout will use the main river when the tributary flows too low to sustain life, then move back when conditions improve. In my experience, trout are not so ‘residential’ in the traditional way, so returning to an area that previously held no stock can be productive. Big fish always move into the tributaries at spawning time, so late in the summer is a good time to find them hanging about the mouths. Alternatively, in a large braided river, a rogue branch can often break away and track along one bank for several kilometres before rejoining the main flow. This stretch of water behaves like a small stream as it flows along under willows and through previously created large deep pools, and is an excellent source of good ﬁshing which is well stocked from the main river. These streams are easily spotted from a jet boat but are usually undetected by all but the most avid fly ﬁsherman on foot. It’s an exciting and ever-changing pattern which can result in successful days being more likely than blank days. It’s the sight of a large trout feeding lazily in a knee-deep pond, where a flick cast that hardly pulls the leader from the tip is all it takes to place your deceiver in front of the quarry’s nose. That is what draws me back. For many years now I have been travelling the catchments of most of the river systems in the South Island by foot, vehicle and boat. Some of my best days fishing have not required a boat and some of my best days of boating have not required a fishing rod. However, there are some very special places that can be accessed easily by jet boat, which makes for a superb day of fly fishing. Within two hours drive of Christchurch, there are some major catchment areas. The Clarence River over Jacks Pass behind Hanmer is not often reported on these days but is itself a productive fishery that also has some beautiful side streams feeding in. The Leader Dale is accessible by foot and is a good if often visited spot. For the more adventurous boatie, there are some significant waters downstream of the confluence of the Acheron River with the Dillon featuring highly, particularly late in summer when large spawning trout are apt to move into position. But be wary, the Clarence then funnels into a very difficult gorge with no fishing opportunities. The Waiau River has some good fishing spots all along it, from Spotswood to the upper gorge beyond Glenhope, Check out the Emu Plain area where the small creeks flowing easily across open farmlands converge with the main flow. The Hurunui River is fishable all through the lower section up to the Amuri Plain (Balmoral Forest). The gorge is open and safe for boating, with good fishing opportunities throughout. Although it is boatable all the way up to South Branch and beyond to Lake Sumner in fresh flows with the Maori Gully section being quite demanding, I much prefer to fish this upper section on foot. 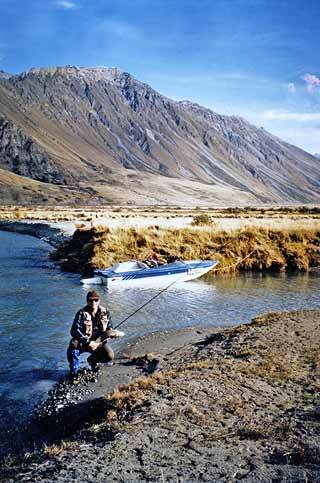 The Waimakariri River in the gorge section has a number of tributaries that make for a good day of fly fishing. Broken River is probably the best known, and always seems to hold a good stock of brown trout. There is easy walking beside the river that takes you past the old coal mine ruins and Winding Creek, another excellent fishery with its headwaters originating at Lake Pearson. When the main river is very low and clear in late summer, the pools in the gorge of the Waimakariri can be fished with good results. I remember spotting and catching three out of four large brown trout in one pool that also had two salmon cruising in it. 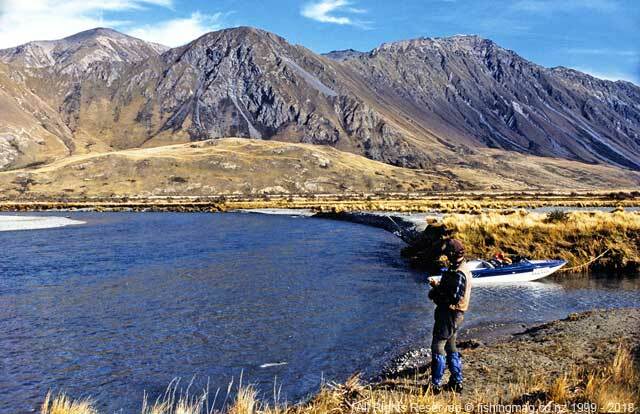 The Rakaia River has limited appeal to the fly fisherman. The upper section gives access to the tussock flats area, including the well known Glenariffe Stream and others like it, although these are easily accessed by vehicle and foot. 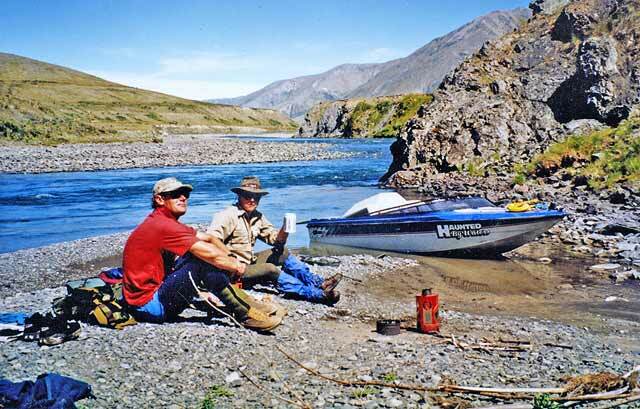 The Rakaia is a much better river for salmon fishing and is boatable throughout its entire length from the sea to the mountains, affording access to marvellous salmon waters. The upper Rangitata River gives easy access to the excellent Hydra Waters. 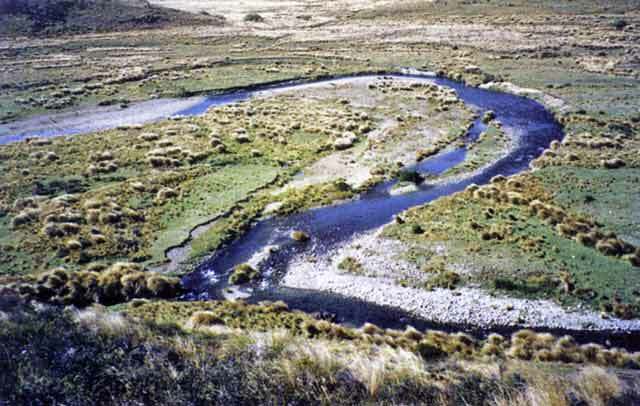 These are the spring creeks and tributaries that flow across the tussock flats from about Rata Peaks Station onwards. Scout Stream (Mesopotamia Station side) and Deep Creek (Erewhon Station side) are favourites. One recent bright summers day, the big browns were surface feeding so vigorously that the smack of their mouths made a sound like a crowd clapping at the cricket. With the whole terrain to myself, the glaciered Southern Alps twinkling in the background, I thought l must have died as this was heaven. These are just a few of the spots around Canterbury that are easily accessed by jet boat. There are enough possies around the mainland to write a book on (now there’s a thought!) But then the delight is in discovering these places for yourself. So what does a jet boat cost’? An older boat suitable for river fishing could cost $6 – $8,000 complete, and on a road trailer. This is a little more than the 4 wheel farm bikes we see so many of around the salmon rivers. Granted, you will need to buy a life-jacket and need a car suitable for towing it, but the entry level need not be expensive, and it’s a good idea to start with a small light boat to learn the basics before trading up. From here the boats could cost a lot more, but the most popular river ﬁshing jet boats would change hands for between $10 – $15,000. For the novice jet boat owner, the thought of launching in a river and setting off in hot pursuit of a large trout needs to be tempered with some of the practicalities of learning to drive and navigate in this environment. But the antidote to making mistakes is usually having the knowledge and Jet Boating New Zealand is very welcoming of new boaters. They have an active membership who hold basic safety days, novices days and family fun days regularly in its extensive calendar of events. This is the best way to become involved in the sport so that the learning curve is enjoyable and safe for everyone. The Association also publishes a booklet available to its members, which classifies and describes all the river systems in New Zealand. The booklet gives a full description of every river, including where to launch, any restrictions applicable, and the type of conditions likely to be encountered at various stages along the way, including river distances and the like. So if you are looking for a different angle on your angling, with a totally different way to view the waterways, think about our Kiwi icon, the jet boat. Invented right here in the South Island by Sir William Hamilton, they were born in the rivers to play in the sea.